on soundcloud the play buttons do not appear to work. also clicking on a download link gets no response, I have to right click and save target as. This happens on a number of sites. If these sites use Flash or other plugins (and I believe Soundcloud does), plugins are not supported in TenFourFox. You will need to use a different browser for those sites. Thanks. The downloads are just regular sites? I take your point on TENFour and Flash! Can you please provide a screenshot or link to the affected site? soundcloud.com does not work on my machine. Same symptoms. soundcloud.com does work (after a lot of lag and what I thought would freeze) in safari. soundcloud.com is broken in FireFox 10 on my Ubuntu Linux box. Same symptoms. soundcloud.com does work in Chromium 16. Cameron, based on this, it appears to be an upstream? The issue is still present in TFF 10, even with plugins enabled and the newest PPC Tiger flash. The problem does occur in Safari 4.1.3 with plugins disabled. So, it appears we have two issues. A. Some sort of issue native to FireFox. B. The site requires plugins. So, it needs flash and it doesn't like Gecko. Theo, thanks for the detailed test -- I'll take your word for it since it appears to need a Facebook login and I'm a long-time Facebook boycotter. Given your report, yes, this looks like Soundcloud not playing nice (in addition to the Flash problem). Ashley, you may wish to notify the site as a user (tell them you are using Firefox -- they may simply say you are "unsupported" if you tell them you are using TenFourFox, even though TenFourFox is almost identical). But this doesn't appear to be an issue we can fix based on these tests. You could use Safari in the meantime. I'll leave this open for a bit in case more information comes to light. Theo & Ashley, please check if you have Flashblock installed. It appears to interfere with Soundcloud. If I disable the add-on completely in the Add-ons Manager, the play button in Soundcloud does work with TFF 10.0 (proof: screenshot). I am using flashblock on both of my platforms. After disabling flashblock and with flash enabled, it plays in FireFox 10. However, I am not using flashblock (or any other add-ons) with Camino, so that appears to be an actual incompatibility. Soundcloud also has an HTML 5 opt-in program like youtube, but apparently it only works in Safari or Chrome. I tried in Chromium 16 and the HTML 5 audio does not work with or without plugins enabled. So, unless we can get the HTML 5 audio to work, this falls under "Needs Plugins", which falls under, "Use at your own risk". I haven't used Camino in ages, but I seem to remember that it has its own flashblocker implemented that's probably sort-of related to the Firefox add-on. And yes, missing H.264 support may be the reason why Soundcloud's HTML5 feature only works in some browsers. Ashley, I apologise for the cryptic answers, but it appears we now have a verdict. Standard soundcloud.com uses flash. Flash is a plug-in and is not supported in TFF. The site itself is also incompatible with the flashblock extension. Ok, so if flash won't work, then use HTML 5? Well, HTML 5 has two main sets of codecs, h.264 and WebM. 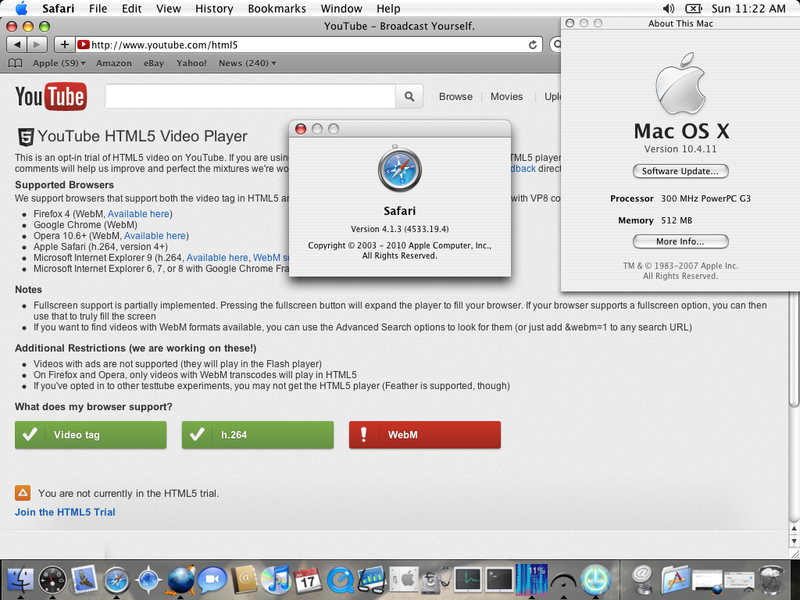 Safari and Chrome support h.264 whereas TFF supports WebM. The HTML 5 opt-in on soundcloud.com appears to only provide h.264 making TFF unable to utilize it. A. 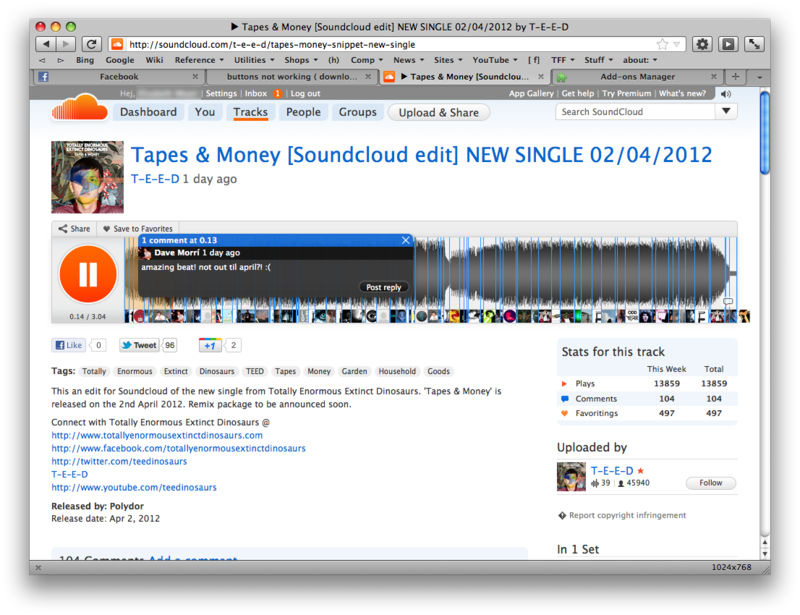 Use Safari and use the standard flash version of soundcloud. Nice and Easy. B. 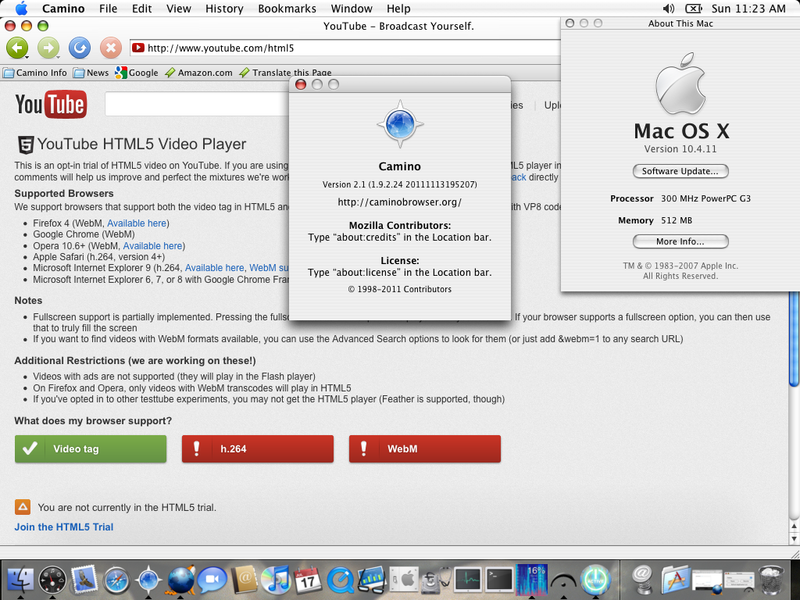 Use Safari and use the HTML 5 opt-in on soundcloud. Nice and Easy and allows you to disable plug-ins in Safari if you so wish. Disable flashblock if you use it. Enable the hidden plugin mode in TFF. 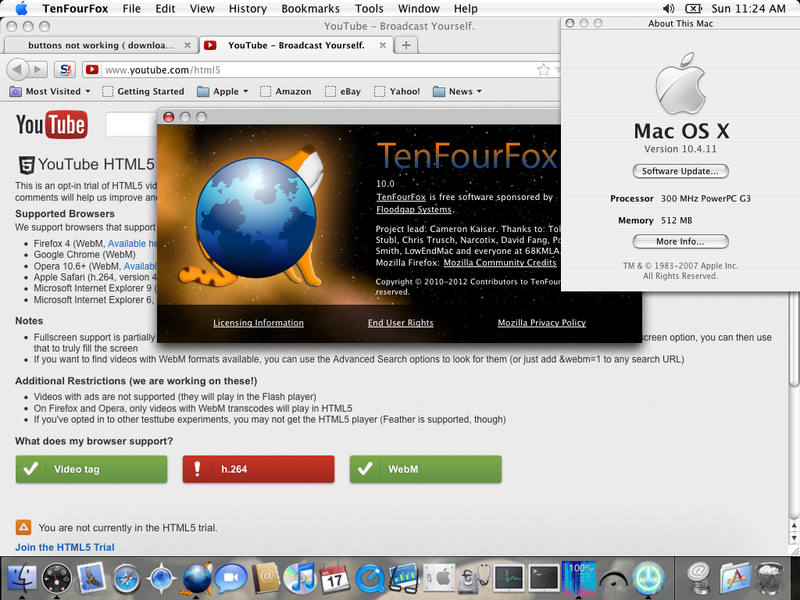 "Flash is a plugin, and plugins are no longer supported in TenFourFox. Since most plugins are now unsupported by their vendors on the PowerPC platform and don't receive updates anymore, they're a security risk, and they don't work right anymore in many circumstances, causing crashes and other unexpected behavior. Therefore, they're switched off by default. If you absolutely require Flash and other plugins, you can use Camino, OmniWeb or Safari. You can also switch plugins back on in TenFourFox (see http://code.google.com/p/tenfourfox/wiki/PluginsNoLongerSupported). Note that this mode is unsupported." I reiterate Note that this mode is unsupported. If you choose to re-enable plugins, please be aware that flash is not the only outdated plugin you are likely to re-enable. I'll have a look at how 'the unsupported mode' works. Currently I have been running both browsers. Youtube video, gives me a 'TFF' does not support! then plays the video's I think I enabled the HTML5 playing. I now have also enabled the HTML5 in Soundcloud. If there are any more remarks, feel free to re-open the discussion. Chris (chtrusch) closed this discussion on 02 Mar, 2012 01:23 AM.